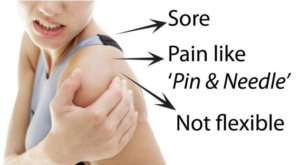 A frozen shoulder, also known as Adhesive Capsulitis can be a very daunting experience and it may well be one of the main causes of your persistent shoulder pain. It occurs over time, and could hamper your ability to perform basic daily activities. Extremely painful or freezing stage: It may begin as a minor shoulder ache and then slowly graduate into major pain. 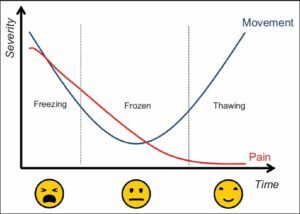 Freezing stage typically lasts from 6 weeks to 9 months. The frozen stage: Your pain may reduce over time, but the stiffness remains and the inability to perform daily activities could still bother you for around 4–6 months. The thawing stage: Shoulder movements slowly begin to improve during this stage, but not completely if you do not take the help of surgical or nonsurgical treatments – which we will talk about later in this blog. 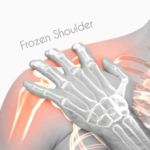 Frozen shoulder condition affects both active and passive range of motion of one’s body. 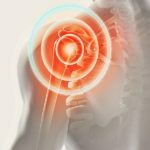 How to diagnose a Frozen Shoulder Condition? During your physical examination, your shoulder specialist may ask you to perform a simple activity or move in a certain way so that he can check your different range of motions. He may also order you to go for imaging tests like MRI, X-ray scans, ultrasound etc. Age: Mid 40s is the period when shoulder deterioration and other shoulder joint problems usually begin to pop up. Regular muscular exercises with correct posture movements will go a long way in keeping your shoulder in a good condition. Gender: According to World Health Organization, women are more likely to suffer from frozen shoulder condition than their male counterparts. Genetic Diseases: 15 to 25 percent people with genetic diseases such as diabetes etc develop frozen shoulder condition. The symptoms may be more severe than other risk factors; though the reasons for it are yet unknown. The focus of frozen shoulder treatment is to control pain and restore motion and strength through physical therapy. Most people with frozen shoulder condition improve with relatively simpler treatments like non-steroidal anti-inflammatory medicines, steroid injections and hydrodilatation. If a nonsurgical treatments does not work, then you will have to opt for surgical treatments. It is important to talk with your shoulder specialist about your potential for recovery continuing with simple treatments, and the risks involved with shoulder surgery. A surgery where your shoulder surgeon will cut through the tight portions of the joints and release your contracted muscles. An anaesthetic procedure where your shoulder surgeon will force your shoulder to move, which can cause the capsule tissue and scar tissue to stretch or tear. Sometimes, a combination of both arthroscopic shoulder surgery and manipulation under anaesthesia might be used to obtain maximum results.